This project ended successfully on 19/7/2018 08:30! 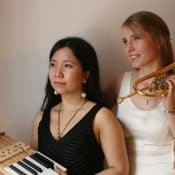 le2dam is a female piano and trumpet duo exploring repertoire for this unique combination of instruments. They got to know each other during their studies, and they are both professional musicians living and working in Vienna. After an enthusiastic review of their music (Spring 2017) in English, German and Chinese, they're taking things to the next level with their debut CD.